Gated offers can be useful in digital marketing campaigns. Your gated offer can take five forms. These gated offers offer value by educating the lead on a particular topic related to your brand while also highlighting features of a solution, product, or service you provide. Your gated offer does not have to be the length of a Tolstoy novel. Besides being ultraspecific, gated offers should be easy to consume — they should not be a 14-day course or a 300-page book. Rapid consumption of the gated offer is important because you want to provide value to your lead as quickly as possible. The faster your gated offer provides value, the quicker a lead can become a paying customer. Because most gated offers can be sent digitally, they can be delivered instantly, which allows the lead to receive the value of the gated offer quickly. Ideally, prospects receive value from your gated offer within minutes of giving you their contact information. Speedily delivering value helps to build a positive relationship with leads, as well as to quickly move them through the customer journey. Reports (also called guides) are among the most common types of gated offers and are usually mostly text and images. Reports usually offer facts, news, and best practices that are relevant to your industry and your target market. If you use a report as your gated offer, however, be careful. Reports can be lengthy and complex, thus they often take more time to be consumed, which means that the report will take longer to deliver on its value. Therefore, whenever possible, keep your reports as succinct and specific as possible so that they can quickly deliver their value and help to establish or reinforce a positive relationship with your lead or customer. As is true of a report, a white paper is an authoritative guide that concisely informs readers about a complex issue and aims to help leads understand an issue, solve a problem, or make a decision. Although the white paper helps to educate your prospects, it also helps to promote your business’s products or services. White papers can often be very effective at generating business-to-business (B2B) leads. Primary research is research that you or your business collects. It can include interviews and observations. When you take the time to create new research, you’re providing a service and saving others from having to do their own primary research, which is why people opt in to a gated offer of this nature. If you’re an expert in your field, or can partner with one, you can host an online training via a webinar that teaches or demonstrates a topic that is relevant to both your brand and to your target audience. You create a gated offer that requires prospects to fill out a registration form for the webinar, thus capturing prospects’ contact information and allowing you to follow up with them after the webinar takes place. In some cases, the most desired pieces of information for your market are pricing and descriptions of your products or services. This information helps people who are interested in buying your product or service make informed decisions. The sales material gated offer tends to be longer, in text and content examples such as images or customer testimonial videos, than other examples. However, this length is necessary because a person generally needs more information before making a purchase, especially if a big-ticket item is involved. However, this also means that anyone who opts in is more likely to be a qualified lead. IKEA provides a wonderful example of the sales material gated offer. The Scandinavian chain collects contact information in exchange for its catalog, which lists all its products. 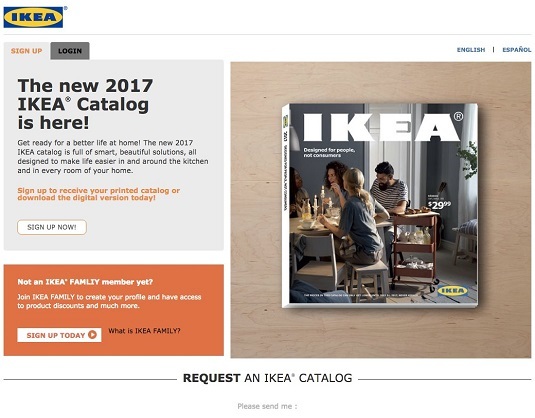 This image demonstrates IKEA’s gated offer, and because IKEA can deliver its catalog digitally, it speeds up the delivery of value to the new lead. IKEA’s sales catalog is an ideal example of a sales material gated offer.